I would like to thank the Aspen Institute Romania and the German Marshall Fund of the United States Office for inviting me to deliver a keynote speech at the opening of the Sixth Edition of the Bucharest Forum. I am grateful to the organizers for this excellent opportunity to address an extremely provocative, overarching theme: Center and periphery - bridging the divide. 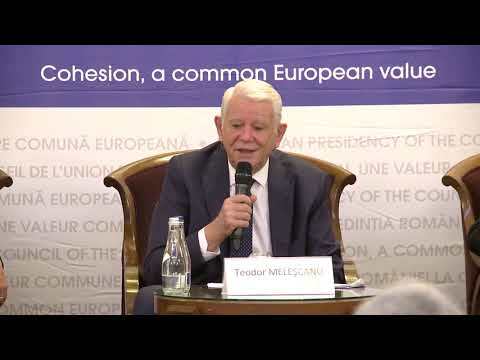 I am hence confronted with a well-known dichotomy, widely discussed over the last two centuries, and especially brought forward, under various interpretations, in several recent key speeches on the future of Europe. It is true that we witness an autumn animated by an overwhelming number of inspirational discourses appealing to unity, to overcoming divisions and, above all, to rediscovering the European common values and consensual interests. I personally believe in the need for such forward-looking visions about the common future. They are there to guide our decisions when we reach the crossroads of history, in order to build a lasting future of our choice. Two weeks ago, the President of the European Commission, Jean-Claude Juncker, pointed out that Europe extends from Vigo to Varna, from Spain to Bulgaria, and that “our continent must continue to breathe with both its lungs”, from East to West and from North to South. It was his metaphorical way of saying that Europe's chance to revive is based on unity and solidarity. No center and periphery in Europe’s two lungs. Shortly thereafter, French President Emmanuel Macron revealed his ambitious proposals for reforming the European project by reiterating his advocacy of a “multispeed”, aspirational and inspirational Europe. A Europe with a renewed Franco-German partnership serving as an engine driving the EU forward. It was his turn to put a positive spin on the idea that building a strong and efficient core, with countries agreeing on specific reforms, might not have to wait for wider consensus to move ahead. Obviously, this dilemma of unity without uniformity is difficult to overcome in a Europe of 27 Member States. However, we could try to rethink its essence by abolishing dogmatic antagonistic models. The dialogue on the future of Europe needs to move beyond the sterile clash positions and explore creative solutions that can bridge the divide, as Aspen and GMF have put it forth today, eventually even eliminating the temptation of a further divide. Perhaps it is the time to think of a Europe shaped like the current inter-polar system. A Europe as a network or a flexible architecture of networks of inseparably interconnected centers, where values, projects and ideas can be reciprocally transferred to the benefit of all actors open to capitalize on them. Europe as a sum of networks where the dots on the map unite by mutual flows of ideas, data, information, trade, human exchanges and so on. It is time to think of a continent without “core and peripheries” projecting its transforming power within its societies, as well as beyond its borders. The European project has never been built on self-contained principles. Europe’s architecture has been shaped by its engagement with the rest of the world, by encounters with the EU member states, with the Western Balkans candidate countries and those in its Eastern neighborhood, as well as by its strong relations with the partner across the Atlantic. We have to keep ourselves open to the positive influence of these shaping factors, in order to keep alive the Union’s force of attraction. I am therefore on the side of those who say we should go beyond traditional dichotomies: “core vs. periphery”, “federalism vs. inter-governmentalism”, “more vs. less Europe”, “East vs. West”, “North vs. South” and “Old vs. New Europe”. Let us focus mainly on what can lead us to a “better Europe”, a Europe able to regain the confidence of its citizens, even the ones living in the very classically considered EU “centres”. We all know that over the last couple of years, the EU has been confronted with uncertainty and multiple crises: from the security pressures, Brexit, the threat of terrorism and the rise of populism, to the migration crisis or economic and financial challenges. In light of the British vote to leave the EU and the emergence of populism in several Member States, some serious doubts were voiced across Europe and beyond, whether the EU would survive 2017 or this was just the beginning of the end. However, approaching the end of 2017, the EU is both in better shape and in a better mood, and there are still a number of reasons for staying optimistic. I am convinced that precisely these challenges facing Europe have brought a positive meaning of the “crisis” to the forefront: the strong and widely shared certainty that an integrated European future offers clearly better prospects for European countries and citizens than a fragmented one. One year ago, the Bratislava Declaration reiterated the strengths of the EU raison d’être, highlighting the fact that EU remains indispensable for addressing any new challenges we are confronting. On the same line, the Declaration adopted by the EU leaders on the Sixtieth Anniversary of the Rome Treaty, in March 2017, reaffirmed that “the Union is undivided and indivisible.” However, beyond these political statements, there is a risk that a complacent Europe may move its attention from various concrete problems. While today EU leaders are rather justified in feeling confident and ambitious, it is essential to remain realistic and pragmatic, and to avoid overconfidence, as one year ago we were trying to avoid over-depression. First, when setting new ambitions for the EU, any roadmap needs to be based on a solid understanding of the EU’s vulnerabilities and a realistic assessment of its potential. Otherwise, the current European euphoria might pave the way to another descent into pessimism, polarization and deadlocks. European leaders must continue to strengthen the European consensus by pursuing pragmatic, results-oriented, ambitious, but realistic and widely shared priorities. Second, it is important to regularly check the pulse of populism, as well as of the Eurosceptic and illiberal tendencies, to be sure that these symptoms do not turn from controllable chronic diseases into pandemics. We must be strong enough to look into the caricature of Europe these trends are drawing and learn from that where the real Europe needs improvement. Third, we should make efforts to bridge any divisions by engaging the European citizens and by promoting common and inclusive initiatives for the benefits of all EU member states. Even if both Paris and Berlin have pro-European leaders with strong new mandates, which is an excellent opportunity to revitalize the European project, their cooperation is a crucial, but not sufficient condition for the EU to move forward, while preserving unity and cohesion. In order to avoid any centrifugal dynamics, it would be useful for Franco-German initiatives to get the support and stimulate ownership of governments along the North-South and East-West alignments. Fourth, it is essential to use flexibility and variable speeds scenarios with prudence, keeping them as measures of last resort. The EU should aim for as much unity as possible and as much flexibility as strictly necessary. Last but not least, Europe should continue to enhance the transatlantic partnership, which is in fact irreplaceable - the main pillar of European security and stability. The EU and the US need to work together to prevent major conflicts in the world, and to jointly manage the pressures that erode the very fundaments of the international system. Jean Monet’s words, “Continuez, il n'y a pas pour les peuples d'Europe d'autre avenir que dans l'Union!”, still have today an inspiring significance, especially in the context of the future of Europe debate. Our leaders in Romania are determined to continue. We are discussing ways to become a re-founding member of the EU, upholding core values of the European projects and aiming at real convergence in order to become a Eurozone member. Having such in-depth discussions in Bucharest demonstrates the analytical toolbox of “center-periphery” paradigm is long gone. I would rather believe our world is one of networks and free flows. And I hope the free flow of ideas will be the main characteristic of the Bucharest Forum debates during this year’s edition too.